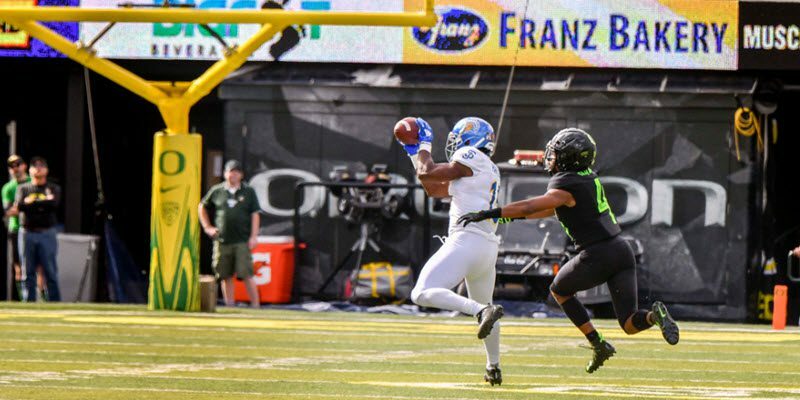 It was bound to happen: just as everyone was satisfied their Ducks were looking sharp and coordinated, everything went bonkers with Oregon staggering against San Jose State 35-22. The offensive line committed its first false start and the Ducks committed three major penalties — one of which was a 10-yard holding penalty which negated a 95-yard kickoff return for a touchdown (that would be a 98-yard penalty and minus six points). Heisman quarterback candidate Justin Herbert had, for him, a miserable day: throwing two interceptions and completing less than 50% of his pass attempts. In addition the big, powerful offensive line we’ve heard so much about did not show up and it reflected in the Ducks’ pitiful 2.7-yard rushing average. Oregon’s secondary was torched for 13.4 yards per-completion (20) and the left corner was consistently beaten deep — a product of either a personnel mismatch, or perhaps, a lack of coordination with the safeties. Either way, it presents a serious problem Saturday for a defense that has to focus in on Stanford’s great running back, Bryce Love. In this video clip above, Herbert throws a 66-yard bomb to tight end Jacob Breeland for Oregon’s second touchdown of the game. Tight end Ryan Bay releases inside about 10 yards deep and attracts the attention of four defenders who have him boxed in. Unfortunately for San Jose, nearly every other Duck receiver is wide open. The Spartan safety over-commits to Bay across the middle and realizes too late the threat of Breeland coming out of the backfield and heading deep on a wheel route. The linebacker to that side backed up outside, giving Breeland even more room to run his route and like the safety, realizes Breeland going deep too late. The Ducks’ running back, coming wide on the same side as Breeland, would have probably been the go-to receiver had the safety and linebacker done a better job. Receiver Johnny Johnson III runs a beautiful route above on this touchdown pass from Herbert to put the Ducks ahead 21-6. Johnson releases upfield and toward the corner of the end zone, which pushes the corner covering towards the sideline. Johnson then releases to the post, and because there is no safety help inside, has lots of room to give the quarterback for his throw. As in the first video, poor safety play dooms the Spartans, who came into the game with one of the worst pass defenses in the country. On this play above, the Ducks have no safety in sight to help cornerback Thomas Graham Jr., who is faked out badly by the receiver on his release from the line of scrimmage. The release backs Graham on his heels and gives the receiver more room to release deep inside the corner for a 38-yard gain. Graham’s inside foot is aligned on the outside foot of the receiver, so maybe he feels, or knows, that he will get help on a throw deep inside of him. If that is the case, the corner will be able to see the quarterback and the ball, but he has still given up the position advantage to the receiver. It could be expected if all this is true, for someone to help in the deep middle. Unless you could talk to the secondary coach, you can’t really know who messed up — it could be the corner, the safety, or both. This 52-yard gain for the Spartans above sets up a touchdown as Oregon’s corner is again beat deep. It appears he could have some help over the top, but the safety, Ugo Amadi is in poor position to do so. He is too shallow perhaps, given that the free safety is also right there — both Ducks covering the inside receiver and leaving Graham by himself, “on an island” as they say in the broadcast booth. Once again, Oregon’s left corner is beat deep for a 33-yard gain to the Duck one-yard line, (above) another example of giving the receiver an inside release and not being in a position to make a play on the ball. The two Oregon safeties are stuck covering the slot receiver, with neither in position to help the corner, who throughout this game, needed it. Stanford will Watch this Film! The last three videos of this analysis show you a problem the Duck defense faces right now and you can bet one of the first things the Cardinal will do is test Graham on a deep route, maybe after setting him up with a short one. Unless you know the exact coverage Oregon should have been in, it’s impossible to know who was at fault — at the very least, the Ducks, like San Jose State, got burned by poor coordination between corners and safeties. 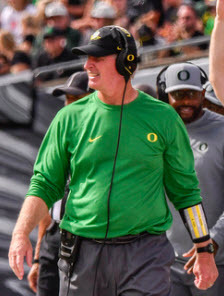 Defensive Coordinator Jim Leavitt will need to huddle with his secondary coaches to fix this, while keeping in mind they must also defend against a big, nasty Cardinal offensive line that wants to make a statement on behalf of their own Heisman candidate, Love. Love can’t beat the Ducks on his own, but unless the Duck secondary is repaired and set straight, the Cardinal pass offense will seal the coffin. Look for this battle as you enjoy Oregon’s first competitive game of the season. Ken also conducts weekly coaching clinics for fans at Eugene’s Valley River Inn every Thursday during football season at 6:00 PM. The clinics are free and open to the public.